New England Spider Cake. Have you had it? If not, you’ve been missing out on not just the dish but an experience. Spider Cake – just look at that custardy goodness! I guarantee that Spider Cake is like nothing you’ve ever had. Some might liken it to cornbread and it shares some of the same qualities. But it’s not cornbread. Nope, nope, nope, Spider Cake is special. I cannot rave enough about Spider Cake – it’s a kind of moist, almost spoon bread type of cornbread, baked in a cast iron skillet. When you cut into it, there are layers of soft custard-like cake in between the slightly crispy layers of the cornmeal cake. If you’ve had any of the seminola, polenta or cornmeal cakes that have become more popular recently you’ll have an idea of what the Spider cake tastes like. But then, that custard!! Oh, my! That’s what keeps you going back for more. This is one of those “just another bite” type of recipes. Serve it for breakfast with berries, powdered sugar or syrup. Serve it for dessert – maybe later in the evening after a light dinner. Even though it is a little sweet, I’ll sometimes serve it with chilis and soups and pulled pork and ribs and anywhere you would normally serve cornbread. Speaking of cornbread, here’s my menu of Cornbread Recipes if you’d like to take a peek. Why is this called Spider Cake? No, it’s not a Paleo diet thing! Back in the day before ovens were available, this cake was cooked in a hearth over coals in a cast iron pan nicknamed a spider – the pan had multiple legs on the bottom to keep it off the coals, something like the outdoor Dutch Ovens we have today, only taller. And of course, spiders have legs. I originally found the recipe in one of the “Best American Recipe” Cookbooks by Molly Stevens & Fran McCullough. Spider Cake is super simple to make. You’ll notice the recipe calls for 2 cups of whole milk mixed with vinegar. 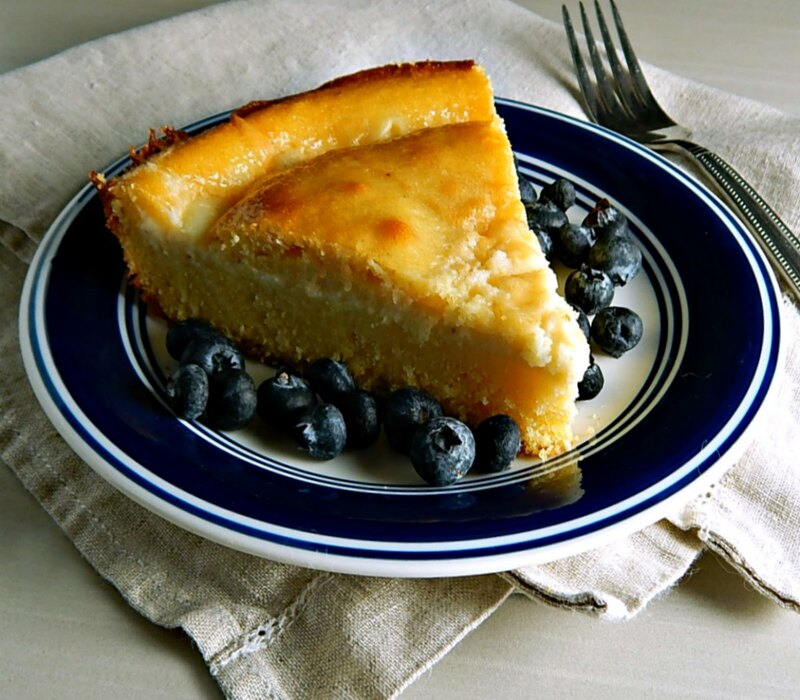 Use buttermilk if you have it, but since the cake is so simple the extra richness from the whole milk helps. And of course, the cup of cream doesn’t hurt at all! I almost always make this in a 12-inch skillet. The cake’s a little flatter, but the layers, to me, seem a little more distinct. Today, when I did the photos in the red skillet, I used a 10″ and as you can see, the custardy layer is more toward the top. No one is paying me to say this, but I love my little red Lodge enameled cast iron skillet. It was a fraction of the cost of the more expensive ones out there, and I count on anything from Lodge to last a lifetime and probably be passed down, too. Whatever you do, make sure to “rest” the batter for a few minutes so that it thickens up just a bit as the cornmeal absorbs the moisture. That extra bit of thickness helps the cream spread properly to form that distinct, custardy layer. Eggs are often on sale during almost any Holiday that normally includes baking. Look specials giving discounts or free eggs when you buy other items like bacon or sausage. Stock up when they’re inexpensive because they last for weeks in the fridge. The date on the container is a ‘buy’ date, and you can expect them to last a good six weeks to two months at home past that date. Never store your eggs in the door; they keep best in a colder part of the refrigerator, in their own box. I ALWAYS look for specials on Cream. it will last several weeks in the fridge (because of the high fat content) if not opened. It is generally a sale on whipping cream (watch for those sales just before a holiday comes up) that prompts me to pull out the few favorite recipes I like to use it in, not the other way around. There are HUGE price variances between on sale and regular pricing. Aldi, too, has great prices. The rest of the baking goods I generally pick up during the fall/winter holidays and/or Easter when almost all baking goods are on sale. Aldi, again, had great prices; they often beat out my grocery store sale prices. Speaking of Easter, that is the best time of year to pick up sales priced vinegar. Look for the basic jugs and watch for the fancier vinegar to be on sale, too. 1 cup heavy cream, but milk works, too; I’ve even seen old recipes made with water. In another bowl, combine flour, cornmeal, sugar, baking soda, and salt. Whisk eggs into the soured milk. Stir the wet into dry ingredients and set batter aside for several minutes. If you skip the rest, you won’t get dramatic of rivulets of cream in the finished product. Put butter in a 12-inch cast-iron skillet and put in the oven to melt. Remove skillet from oven, tilting so the butter coats the sides. Pour in the batter. Very carefully and slowly, pour cream into the center of the batter. Slide skillet into the oven and bake until golden brown on top, about 40 – 45 minutes. Do not overbake! There will be strange cracks emanating from the center of the cake, and it is done when the edges of the cake pull away from the pan. Slice into wedges and serve warm. Note: When pouring the cream, the Spider Cake will work out much better if you use a spouted measuring cup so you have a little more control. This entry was posted in Click here for Fabulous Food Posts and tagged best american recipes, Bread, Breakfast or Brunch Dish, cornmeal, Cream, Desserts, Eggs, milk, new york times, Side. Bookmark the permalink. er made this in a dutch oven? I wondered if it would work for camping?